The Windows 10 November Update or Threshold 2 (TH2) update has fixed a wide range of issues and brought in a bunch of cool features to the operating system. The Find My Device feature is one of them. Those of you who have been using Windows Phone 8.1 or above version will know that Find My Device feature was originally introduced with Windows Phone 8.1 OS, and similar features are already exist in other smartphone operating systems like iOS. 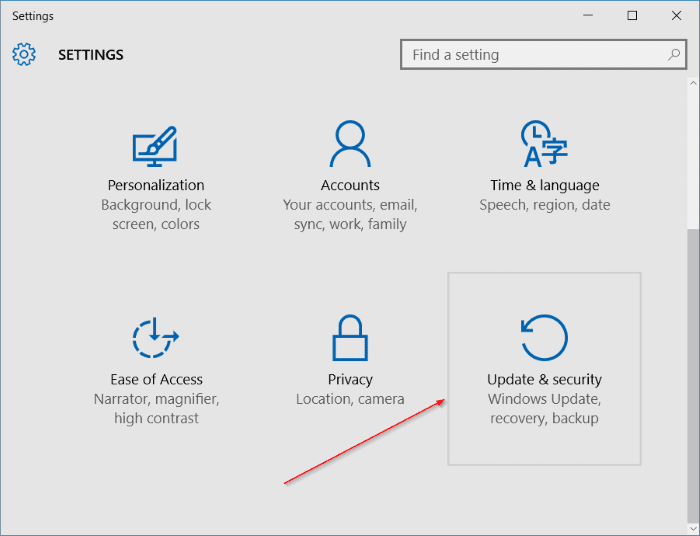 With this big update, the feature is now available for PCs running Windows 10 (with November Update or Threshold 2 update as well, making it easier for PC users find their lost or stolen computers. 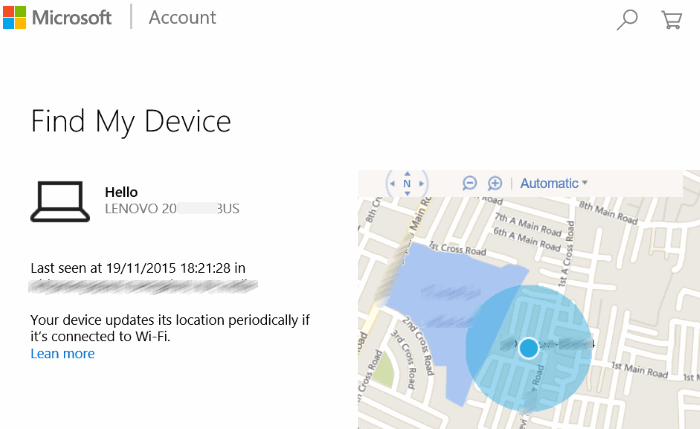 Find My Device is a security feature, which when turned on, periodically saves your device’s location in your Microsoft account so that you can see the location on a map by signing-in to your Microsoft account via a web browser. 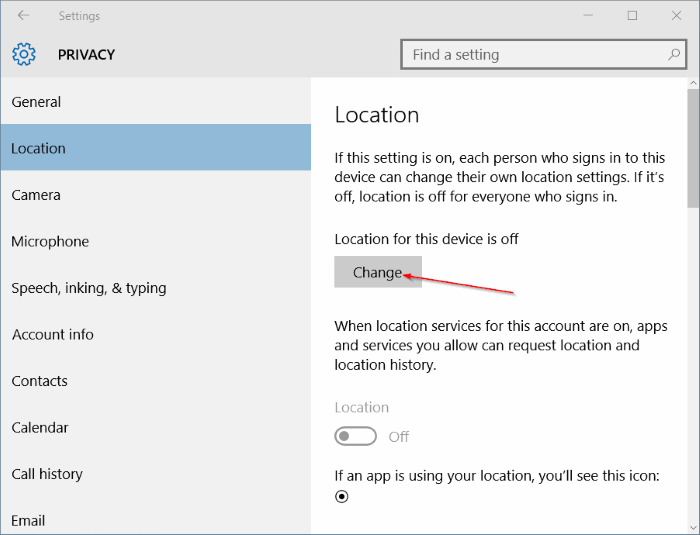 This means, if you lose your Windows 10 device ever or if the device gets stolen, you will be able to view the last known location of the device by signing-in to your Microsoft account in a web browser. How useful is Find My Device feature? The feature although is not obviously useful for desktop computers, users who often carry their laptops and tablets will find this feature extremely useful. That said, you will not be able to track the location of the device unless the device is connected to the internet. Although Find My Device is a fantastic security feature, it’s turned off by default. This could it be because it requires location tracking turned on and not everyone is comfortable with that. Besides that, it requires you use a Microsoft account to sign-in to Windows 10. 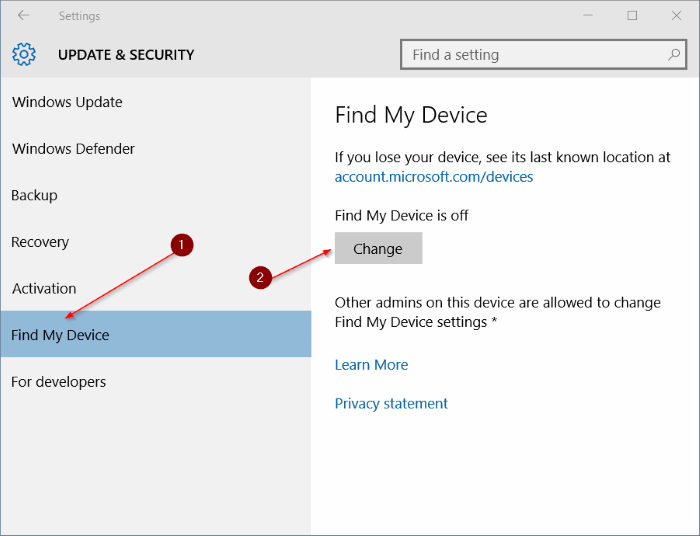 In this guide, we will see how to turn on and use Find My Device feature on PCs running Windows 10 with November Update. NOTE 1: The Find My Device is not available for local user accounts, meaning only users signing-in to Windows 10 with Microsoft account will be able to turn on and use the feature. NOTE 2: In order to turn on and use Find My Device feature, the local tracking or location service must be turned on. NOTE 3: Unlike Find My Phone, Find My Device doesn’t allow you remotely erase or lock down your Windows 10 device yet but the feature might arrive in future updates. Important: We are assuming that you are using a Microsoft account to sign-in to Windows 10. Step 1: Open Settings app either by clicking its icon on the Start menu or using Windows + I hotkey. Step 2: Click Update & security. Step 3: Under Find My Device, if the feature is turned off, you will see “Find My Device is off” as its status. To turn it on, click Change button, and then click the button when you see Save my device’s location periodically to turn it on. Under Find My Device, if the Change button is grayed-out, click the link labelled Turn on location settings to use this feature. Under Location section, you will see Location for this device is off message if the service is turned off. To turn on the Location, click Change button and then click on/off button to turn it on. If you can’t find your device and you suspect that it has been stolen, follow the given below directions to view it’s last known location on a map. 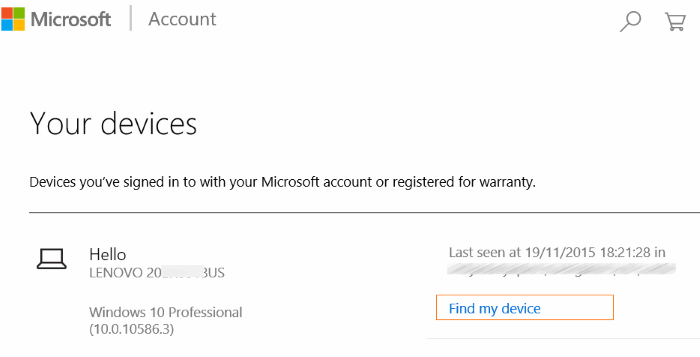 Step 1: Visit account.microsoft.com/devices page in one of your web browsers and sign-in to your Microsoft account that you used to sign-in to your Windows 10 device and activate Find My Device feature. Step 2: As you can see in the picture below, under Your devices, you will see all your Windows devices. The page also shows the last known location of each of your device right next to device’s name. 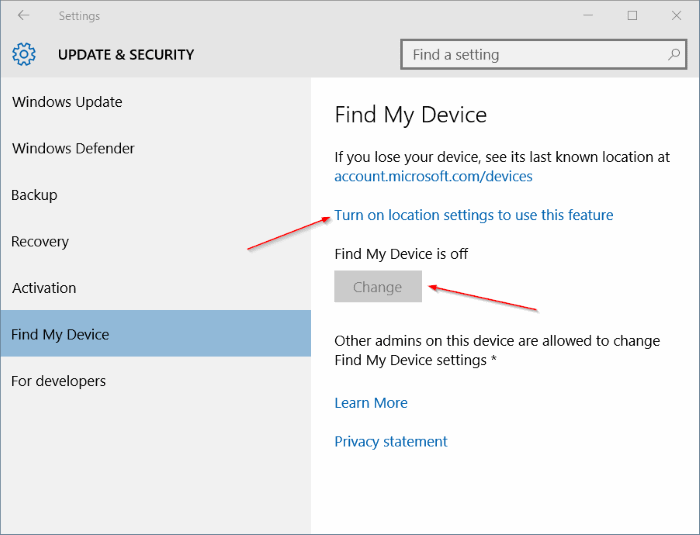 Step 3: Click the Find my device link next to your Windows 10 device’s name (refer to the picture above) to view it’s last known location on a map.